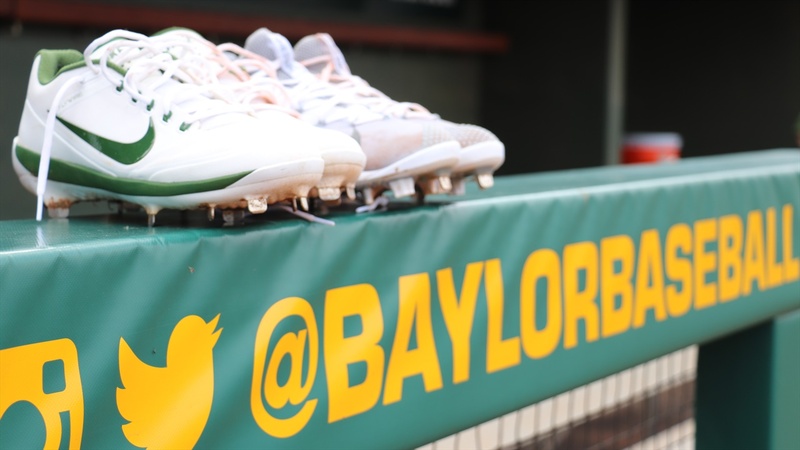 WACO, Texas - Baylor baseball junior catcher Shea Langeliers and junior left-handed pitcher Cody Bradford were named to the 55-player preseason Golden Spikes Award watch list, USA Baseball announced Thursday. The award honors the top amateur baseball player in the country for the 2019 season. For the first time in program history, the Bears have two on the watch list for the prestigious award in the same season. Langeliers is on the list for the second-straight season, while Bradford made the list for the first time in his career. Previous Bears to be named to the list include Logan Verrett in 2011, Kendal Volz in 2009 and Beamer Weems in 2008. Langeliers and Bradford are two of five from the Big 12 on the list. Baylor is one of just 10 programs with multiple players named to the watch list. With preseason All-America honors from D1Baseball.com (second team), Baseball America (second team), Perfect Game/Rawlings (second team), Collegiate Baseball (second team) and the National Collegiate Baseball Writers Association (NCBWA) (third team), Langeliers collected a six honor in the last month. He was also named to the preseason All-Big 12 team. Langeliers, a 2018 Gold Glove award winner and 2018 Second Team All-American, is a two-year starter behind the plate for the Bears. Last season he set career high marks with 49 runs, 18 doubles, 11 home runs, 44 RBI, 35 walks and an impressive .994 fielding percentage. His walk-off RBI single clinched Baylor's first-ever Big 12 Tournament championship and he was named Co-MOP of the Big 12 Tournament with Bradford. Bradford, the Preseason Big 12 Pitcher of the Year and preseason All-Big 12 honoree will add the Golden Spikes Award watch list to a growing number of preseason accolades, including D1 Baseball Second Team All-America honors and Third Team All-America honors by Perfect Game/Rawlings. The Aledo, Texas, native became the first Bear to be named Big 12 Pitcher of the Year after an outstanding sophomore campaign. The lefty, who also earned Third Team All-America honors in 2018, was 7-6 with a 2.51 ERA over 96.2 innings of work. In Big 12 play he was even more impressive, boasting a 1.88 ERA in 52.2 IP, going 4-3 with 2 complete games and 49 strikeouts to just 13 walks. The preseason watch list features 55 of the nation's top amateur players, from high school and college baseball. The Golden Spikes Award Advisory Board will maintain a rolling list of players, allowing athletes to play themselves into consideration for the award throughout the season. The 42nd Golden Spikes Award will be presented in partnership with the Rod Dedeaux Foundation on June 14 in Los Angeles. Since 1978, USA Baseball has honored the top amateur baseball player in the country with the Golden Spikes Award. Following the first-ever presentation of the Award to Bob Horner of Arizona State, the Golden Spikes Award has been presented each year to the player who exhibits exceptional athletic ability and exemplary sportsmanship. The 2018 Golden Spikes Award winner was Andrew Vaughn from Cal. Past winners of this prestigious award include current Major League Baseball players such as Andrew Benintendi ('15), Kris Bryant ('13), Mike Zunino ('12), Trevor Bauer ('11), Bryce Harper ('10), Stephen Strasburg ('09), Buster Posey ('08), David Price ('07) and Alex Gordon ('05). Former Major League stars that have captured the award include Tim Lincecum ('06), Pat Burrell ('98), Mark Kotsay ('95), Robin Ventura ('88), Jim Abbott ('87), Will Clark ('85), Dave Magadan ('83), Terry Francona ('80), Tim Wallach ('79), and Horner ('78). For more information, please visit GoldenSpikesAward.com. Fans can follow the Golden Spikes Award on Twitter @USAGoldenSpikes. Amateur baseball fans will be able to vote for their favorite players at GoldenSpikesAward.com again in 2019, starting on May 15 with the naming of the Golden Spikes Award semifinalists. The list of semifinalists will also be sent to a voting body consisting of baseball media members, select professional baseball personnel, current USA Baseball staff and 40 previous winners of the award, representing a group of more than 200 voters. USA Baseball will announce the finalists on May 29 and fan voting will open at GoldenSpikesAward.com concurrently and will remain open through June 10.